Since it was the first day of spring yesterday it made me wax nostalgic for summer and I found this old post. 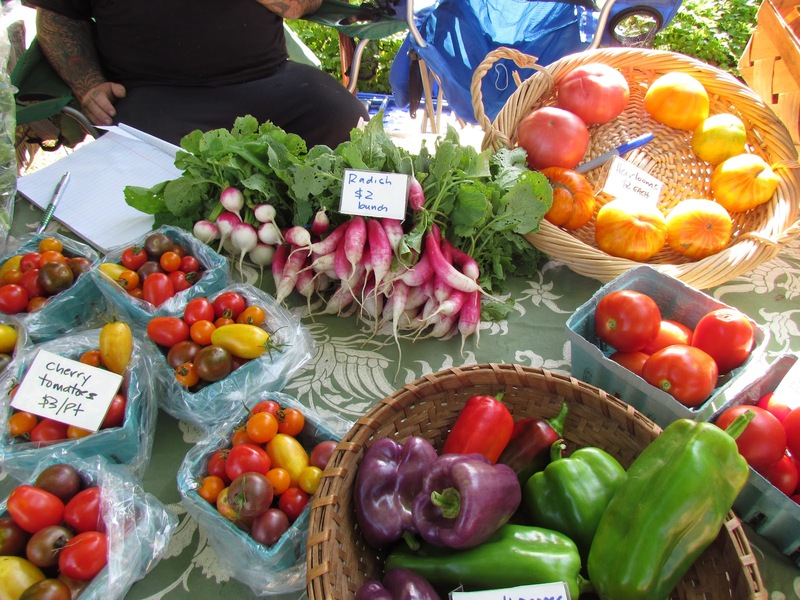 Enjoy and dream of warm days and the smell of freshly picked tomatoes! the cherry tomatoes on display at market! basil of choice (I used fino verde because I had it left over and the leaves are so small it needs no chopping! Heat olive oil in a sauce pan toss in garlic and brown very slightly. 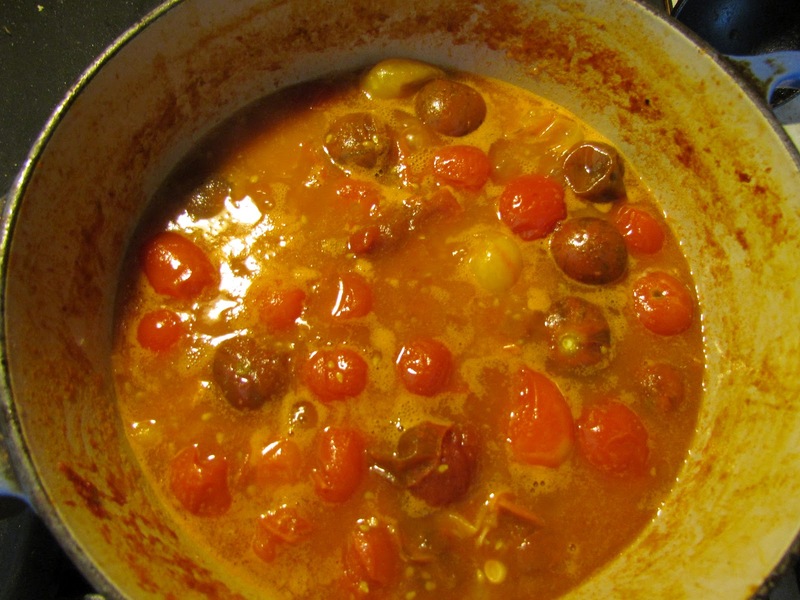 Toss in cherry tomatoes and stir to incorporate over low to medium heat. The cherries getting yummy with the garlic and evoo. The pan is dirty from the previous batch of sauce but i just wiped it out figuring the remnants would just add flavor. Cook for 5-10 minutes until cherries start to break down. Once they have starting to let off their juice add the diced tomatoes salt and pepper flakes and wine. Continue cooking over low heat stirring occasionally for 45 minutes. 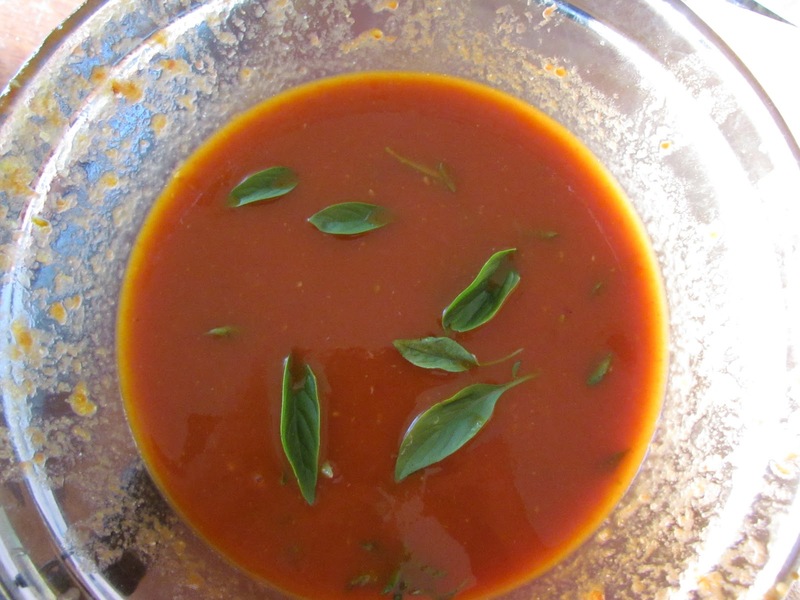 Now depending on your likes and dislikes you can either leave the sauce as it is use for dinner freeze for later or if you are into canning can it for winter. I however abhor seeds and skins cant stand em not a one so I pass my finish product through a food mill to achieve a nice consistent seed free sauce. If you want it a bit smoother but not as nutty as I am you can also use a potato masher to get a finer consistency. Finished product if you like it chunky. Post production notes when I tasted the sauce it was sweeter than I expected so I added a bit more salt again up to you! I would add basil here at the end if this is as far as you want to go with it. Use the Fino Verde its pretty awesome leaves so small they really don’t require any knife work which I think benefits the taste. If you are crazy like me and like no seeds this is what it looks like after I passed it through a food mill I at first didn’t use the smallest disc I had and it let the smaller cherry tomato seeds through so I had to change discs and use the smallest I had which turned out just fine. Finished product after being run through the finest disc on a food mill. 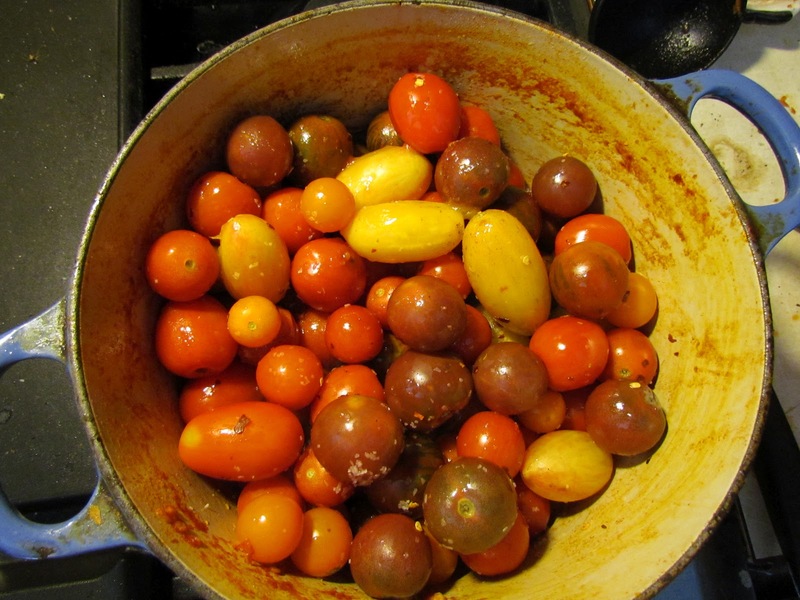 As you can see the color is a little lighter due to the different color tomatoes used. Riff on this recipe which came to me when I took this picture. After the tomatoes start to breakdown add a 1/2 cup or so of chicken stock cook as above add some cream and some black pepper and you would probably have a seriously tasty tomato soup. Next Post Potato Leek Soup – soup of the gods.